Easy - Take the hassle out of small hole drilling with Millmate's Microdrilling Attachment. Millmate's unique in-line spindle design makes set-up a snap by easily attaching to any standard R-8 spindle. No special draw bar required. Just use a deep well 3/4" socket. 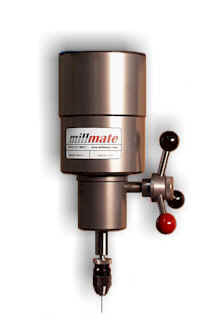 Millmate turns your conventional mill into a superior small hole drill press. Accurate - No more guessing location as with off-set attachments. In-line spindle feature maintains accuracy. Confidence in position is assured as pre-established coordinates are maintained. Sensitive - Quill counter-balanced for most sensitive feel. Extreme sensitivity achieved by eliminating common sources of friction and drag, and reducing moving mass to a bare minimum. Ultra-smooth feel means better control, resulting in less drill breakage and increased productivity. Quality - Designed and manufactured to our high standards. Every Millmate comes with an 1/8" precision Albrecht chuck. A 5:1 speed multiplier gives operators proper speed range. No maintenance required. Useful - Whether you have one hole to drill or thousands, this tool was designed to be operator friendly and practical. Change to a Millmate for small hole drilling applications as you would a tap head for tapping operations. Affordable - Improve productivity and increase profits. Priced at $1,595.00. Includes a durable polyethylene storage case. Are you a shop owner looking for work and have been offered to quote on a job with small holes? A machinist breaking drills that wants to be more productive? An engineer working on prototypes that require small holes but the R&D shop can't produce them? A production shop that wants to improve efficiency? The MDA-01 is the solution to your problems! Don't just peck, peck, peck, and hope for the best....use an MDA and get results! In-line Spindle System Spindle in-line with machine spindle. Simplifies set-up and maintains accuracy. Operator has complete confidence in position as pre-established coordinates are maintained. Versatile Converts a full size mill into a superior small hole drill press. Microdrilling Attachment is a natural extension of milling machine.......small drill press coming out of a big one. More versatile than bench styles. More accurate than off-set attachments. Useful, Easy to Use Simple as a tool change. Easy mounting to standard R-8 spindle. Improve productivity on a variety of small hole drilling applications. Use a Microdrilling Attachment for drilling as you would a tap head for tapping operations. Ultra-Sensitive Extreme quill sensitivity achieved by eliminating common sources of friction and drag, and reducing moving mass to a bare minimum. Operators have better control resulting in less drill breakage. Speed Multiplier 5:1 Speed Multiplier gives operator proper speed range. Size Length as short as possible. Some set-ups make space a premium. No adjustments. Never needs oil. Exceptional value. Made in the U.S.A. for superior quality at an affordable price....$1,595.00. Remove Microdrilling Attachment from box. Tighten draw bar. No special draw bar required. Use a deep well 3/4" socket. Small hole drilling presents significant challenges. We recommend these tips for success. Prepare yourself mentally for the task. Get into a comfortable position. Good posture is important. For control, rest your elbow onto the machine table. For comfort, place something under your elbow for cushioning (we like to use a stack of shop rags). Don't use excessive spindle speeds. Focus and don't force the drill into the part. Concentrate and become an extension of the machine. Watch for chips flowing off bit and change drills that don't feel right. For best results, be methodical and pay attention to what works for you. Repeat the process.